So R and I have our own little pet-family. No kids, thank goodness, just a crazy dog and two cats (crazy is understood with cats). Most of the time they get along pretty well, though the oldest cat can be a bit grumpy and territorial. 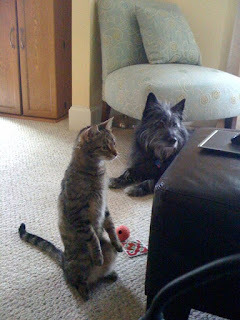 But – the dog (Froggie) and are little cat (Kira) are best buddies. They play together, the cat loves to rub against him at night, and he protects Kira from the mean cat when she gets annoyed at all the nonsense going on. I just had to share this picture of Kira – and one of her prariedog moves as she waits for us to throw her toy. That’s Froggie in the background after they’ve been chasing stuffed mice together. They both play fetch, it’s hilarious! Thanks 🙂 I have this picture on my desktop at work – it always makes me smile. I'm going to have to work on that ball idea! I could make millions!